It’s been a bit since I’ve posted. I’ve been very busy! 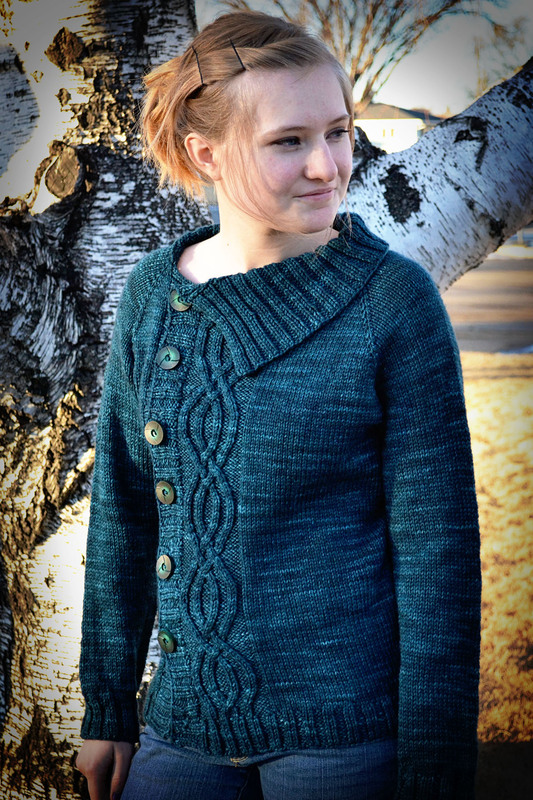 One of the things I’ve been working on is my new women’s cardigan pattern, Foster. 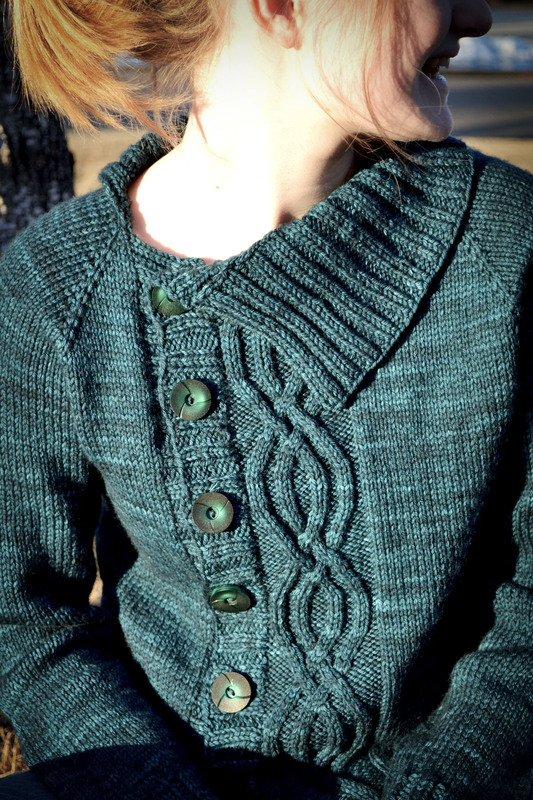 Foster is a top down asymmetrical cardigan. The pattern includes the option of having the sweater open on the left or the right side. The cable runs asymmetrically down the front and is centered on the back. The buttonbands and buttonhole bands are picked up and knit, as is, the collar. Instructions for the body include instructions for a shaped waist and a non-shaped waist. 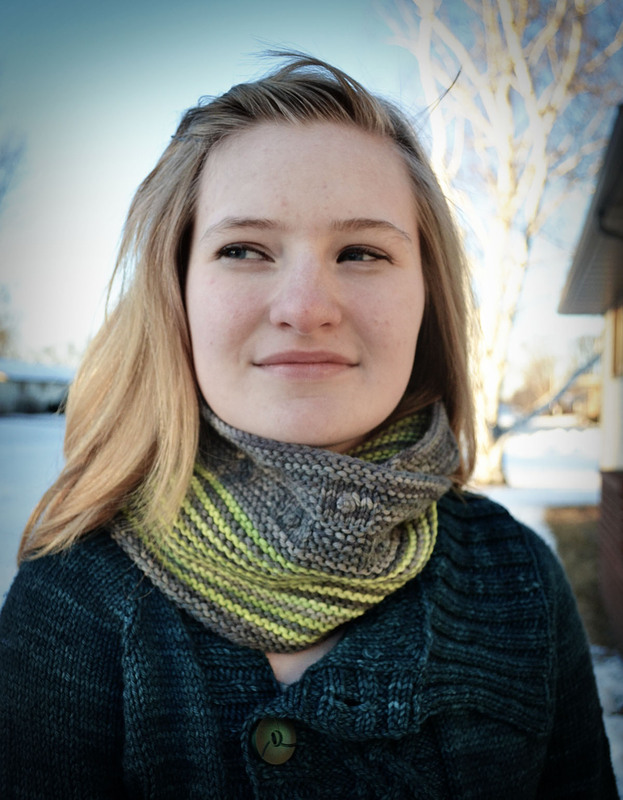 Being that this is worked up in a worsted weight yarn, it’s a quick, warm and cozy knit. The yarn? It is gorgeous. Philomath Worsted from Springtree Road yarns is an absolutely wonderful yarn! It is fantastic off the skein and after a blocking it absolutely blooms and glows! The color is lovely. As an added bonus, Maya from Springtree Road is offering dye to order sweater quantities if you would like to knit up a Foster for yourself in the yarn used for the sample. Just take a look at her colorways. The link for the dye to order is here. All the info you need should be on that link. Even if you decide not to order a sweater quantity, do yourself a favor and check out her other lovely yarns. Thanks so much for stopping by. I hope you like Foster as much as I do! Not that I really went anywhere. In just a few words, I can sum up my absence: Christmas and illness. Christmas really kicked my tuckus(is that how you spell tuckus?). On top of that lovely Christmas(it really was lovely!! ), three members of this house were battling a horrible cough/cold/sinus thing. In fact, we’re still not over it! Seriously, I’m on week 3. This is crazy, right? I’ve also been a bit distracted by the weather. It’s been LOVELY. I’ve been able to take my toddler out 3 days in a row. We have a possibility of hitting 60 today. Yes, I live in North Dakota and yes. I can’t believe we have 50’s in January, also crazy. I’ve also been knitting a lot! I knit a few Christmas presents, which I don’t usually do. I knit 2 hats for my niece and a neckwarmer for my sister. All were very well received. 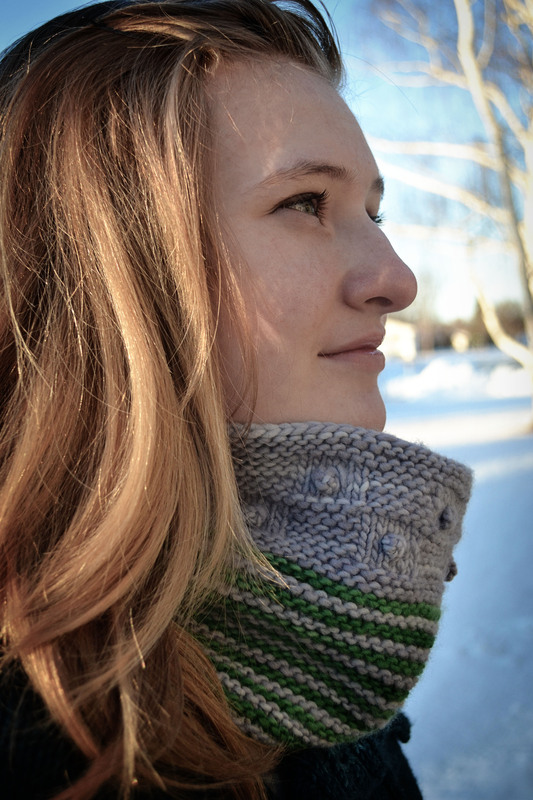 I also knit up a couple sample cowls for a new pattern that I will have coming out very very soon, like..next week soon. It’s a garter based design, knit in the round, and comes in two sizes. The longer version is knit in Knit Picks Swish Tonals. I love the contrast of these two colors. The gray is Thunderhead and the green is Springtime. Here it is wrapped around. This is my favorite way to wear it, especially on a cold morning! Below is the shorter version. 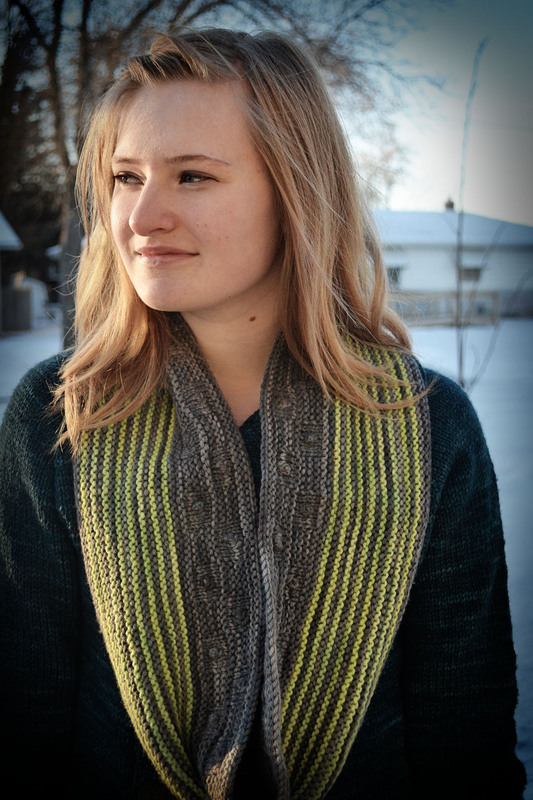 It is knit up in Malabrigo worsted Frost Gray and Verde Adriana. I had the above sample done for some time, but I needed to get the shorter one done. I knew these colors of Malabrigo would be winners because I had recently knit myself a hat (here and there) in these exact colors and I fell in love with the combination. You can see the stitch pattern better here. There are garter stripes leading into a bobble/garter block pattern. Don’t fret on the bobbles, they are small and there aren’t that many! They are quick and painless. I rather like bobbles, but I know some people do not. 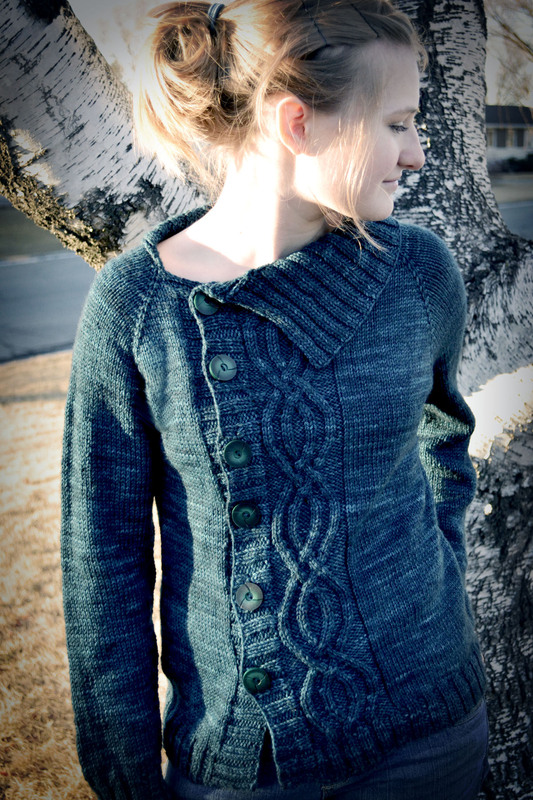 Also coming soon, I have a cardigan with testers and I am working on getting the pattern into shape. Christmas derailed me there too, but I guess that’s the nice thing about self-publishing! I can get delayed and it’s ok!